Features: Glare resistant finish that blends with the outdoors, camo cushion seat, self-filling live well, steering pedals, transom plate, and rear drain plug (Motor package not included). 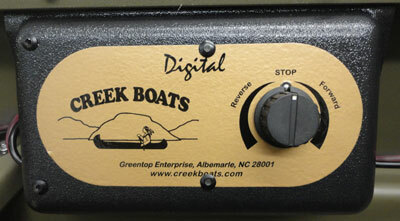 Includes: M-10 Creek Boat with all features listed above plus all contents listed in the digital motor package. 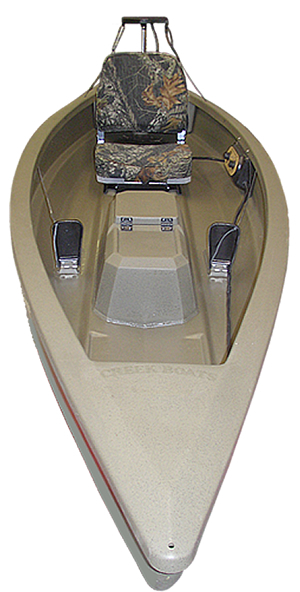 Four different one man Creek Boat models are available. The standard M-10 model is shown above. The weight of the M-10 is perfect for getting into hard access areas and still has plenty of room for your gear. The maneuverability and stability of the M-10 will get you in and out of places that you won't believe.